Here are pups of all ages available for adoption from several local shelters. If you find a pooch you think might be right for you, call the shelter before heading out to make sure he or she is still available. Max may be mini (at only 12 pounds) but he's big on playtime and loves children, cats and other dogs--and he's a sweetheart too. He'd be great for any family who'd love a fun but gentle pup to bring home. Visit Posh Pets Rescue online at poshpetsrescue.org for more information. Young Red Fox loves both people and dogs, and will drop what's he is doing to jump over and meet you. Smart and playful, he's always looking forward to playtime--so any family looking for a fun canine to call their own should come and meet this dude ASAP. Visit Posh Pets Rescue online at poshpetsrescue.org for more information. Relaxed, calm and tolerant, Frenchy grew up with a family and is great with children--even the kind who like to try and ride a dog like a pony--this guy's OK with that! He loves to be petted and to snuggle, but he's also a brainy guy who knows his commands. Great with other dogs and a big fans of walks and toys, this fellow is more than ready to back in a home with people who love him. Visit Posh Pets Rescue online at poshpetsrescue.org for more information. Tiny Cora is easy to carry (just eight pounds!) and loves to sit on laps to snuggle. She loves conversation too--as in you talk to her and she'll gaze back in attention with love in her eyes. She digs other dogs too, and even likes cats, making her a great match for pretty much any family. Visit Posh Pets Rescue online at poshpetsrescue.org for more information. Good with her basic commands, Sophie is a loving lady who's choosy when it comes to other dogs, so she's best suited to a home where she'd be the sole canine. Always down for a walk, she's awesome on a leash and is ready to bring her affectionate ways to you and your family. Visit the Animal Rescue Fund of the Hamptons online at arfhamptons.org or call 631-537-0400 for more information. Before arriving at ARF, Chief spent his entire life as part of a breeding mill, a harsh life for sure. Because of this, he's best suited to a quiet home--and while he's a gentle fellow, he'll need an introduction to children before moving in--and as for cats and other dogs, he seems not to care one way or another. Visit the Animal Rescue Fund of the Hamptons online at arfhamptons.org or call 631-537-0400 for more information. A playful guy great for an active family, Buddy digs other dogs but will chase after any cats. He's good with children, but keep in mind that he's a jumper. A perfect home for him would have owners willing to put a little bit of added training. Visit the Animal Rescue Fund of the Hamptons online at arfhamptons.org or call 631-537-0400 for more information. A sweetheart senior, Petunia was surrendered after living her whole life in a home--so naturally she's a bit confused about why she's now in a shelter. She avoids cats and is choosy with other dogs, but with a proper introduction she could be great around almost any family. Visit the Animal Rescue Fund of the Hamptons online at arfhamptons.org or call 631-537-0400 for more information. Lainey may start off a bit shy, but once she gets to know you it's all love and affection for this young lady. She digs other dogs too, but small children frighten her, so her best situation is a home with grown-ups only. Visit the Animal Rescue Fund of the Hamptons online at arfhamptons.org or call 631-537-0400 for more information. Energetic and powerful, Gabby is a strong dog who needs a big yard for her big ways, and is best-suited to a family with older children due to her energy level--but make no mistake: she's a sweetie through and through ready for a family to love her as she deserves. Contact the Islip Animal Shelter at 631-224-5660 or visit isliptown-ny.gov for more information. Playful and loving, Kobe is an easily-trained guy who doesn't show aggression toward toys, food or the bully stick--he's just not good around cats--so a kitty-free forever home is what this doggie dude really needs. Contact the Islip Animal Shelter at 631-224-5660 or visit isliptown-ny.gov for more information. Shy at first, JJ is actually quite affectionate and warms up fast once he gets to know you. Not only does this fellow love to play fetch and know his basic commands, but he even tests well with dogs and cats, a great recipe for any family looking for a forever friend. Contact the Islip Animal Shelter at 631-224-5660 or visit isliptown-ny.gov for more information. Lola is a 1 ½ year old Chihuahua mix who needs an owner who will give her the time she needs to come out of her shell. She is nervous when meeting new people but once she gets to know you, she is your best friend. She tested well with dogs and cats, knows some commands, and will do anything for a treat. Lola needs a home without small children, older kids would be fine.Contact the Islip Animal Shelter at 631-224-5660 or visit isliptown-ny.gov for more information. Sweet Ivysaur is a peaceful gal who shows no aggression with food, toys or bully stick, and tests well with both cats and dogs. Still undergoing treatment for heart worm, this cuddly pup will need a forever owner ready to keep her up on her needed medical treatments. Contact the Islip Animal Shelter at 631-224-5660 or visit isliptown-ny.gov for more information. Rescued from Alabama, Luke is a cool dude with a happy mug--but only three legs. Nonetheless, he's playful, active and loves to run and play fetch. A snuggly, sweet fellow with people, he's sort-of choosy with other dogs, so a home where he'd be the solo animal would be best. Visit Bideawee Westhampton online at bideawee.org or call 631-684-0079 for more information. A pretty lady with a fluffy tail, Birdie is a happy pooch with a love for attention, so she's best-suited to a family who can give her lots of one-on-one time and love. Visit Bideawee Westhampton online at bideawee.org or call 631-684-0079 for more information. Handsome, smiling Niko is a snuggler who's also a big fan of walks and hikes. He's good with children, but is best-suited to be the only dog in a home, and due to his adventurous nature, he needs a yard with a fence that he can't escape through. Visit Bideawee Westhampton online at bideawee.org or call 631-684-0079 for more information. Charming Elijah is a major love-bug who gives kisses to all. Sadly, he's tested positive for heartworm, but he's being treated and doing nicely--and should you welcome him into your home, the shelter is offering to pay for his treatments (as long as they are done at the Bideawee Westhampton Animal Hospital). Visit Bideawee Westhampton online at bideawee.org or call 631-684-0079 for more information. With one blue eye and one brown, Neida has quite the look. She's bubbly and loving, but needs a family that will bond with her and be a bit patience as she settles in and forms the trust that she craves. Visit Bideawee Westhampton online at bideawee.org or call 631-684-0079 for more information. Pretty little Valentina (only 42 pounds) arrived in February as a stray, and even though she can be a little shy with new people she's a friendly, sweet pooch who loves playing with other dogs. Contact the Town of Hempstead Animal Shelter and Adoption Center at 516-785-5220 or email them at adoption@tohmail.org for more information. King is a good-looking, friendly guy--but due to his guarding issues (toys, food), he's best-suited to an attentive, adults-only home where he'd be the only pet in the house. Contact the Town of Hempstead Animal Shelter and Adoption Center at 516-785-5220 or email them at adoption@tohmail.org for more information. Handsome Haze first arrived at the shelter after being surrendered by an owner who couldn't afford his medical care--then took him back--and then surrendered him again. After such a chaotic series of experiences, he's more than deserving of a forever home; he's lots of fun and good with other dogs--his best situation would involve a loving owner who will also help him watch his diet. Contact the Town of Hempstead Animal Shelter and Adoption Center at 516-785-5220 or email them at adoption@tohmail.org for more information. Toast is a fun-loving, people-loving fellow, but for one reason or another he's been in and out of the shelter nine different times! He's ready for a stable and forever home, but one without other dogs as he doesn't do well with other pooches. Contact the Town of Hempstead Animal Shelter and Adoption Center at 516-785-5220 or email them at adoption@tohmail.org for more information. Arriving at the shelter after being hit by a car, Beau is all better and ready to be adopted. Very smart and curious about other dogs, he does need a slow introduction to his fellow canines--but he's really friendly with people and would absolutely be a great dog for a family that wants a forever friend. Contact the Town of Hempstead Animal Shelter and Adoption Center at 516-785-5220 or email them at adoption@tohmail.org for more information. Rescued from Puerto Rico, Osa was a shy, timid lady upon arrival but is now a sweet and playful pooch, more than ready to be your forever canine friend. Contact the Kent Animal Shelter at 631-727-5731 for more information. Nena, a rescue doggie from Puerto Rico, is more than ready to make her way from the shelter to a forever home and a permanent family. Contact the Kent Animal Shelter at 631-727-5731 for more information. Energetic Fiona is an active lady, so a home with an active family would be her best situation--just be sure to walk her on a leash as she's really skilled at leaping over or climbing under fences. Contact the Kent Animal Shelter at 631-727-5731 for more information. Jade is a little cutie who was rescued from a Texas high-kill shelter, and she's proven to be a real sweetheart. Contact the Kent Animal Shelter at 631-727-5731 for more information. A handsome guy for sure, Justin is a rescue from Puerto Rico ready to call your home his as well. Contact the Kent Animal Shelter at 631-727-5731 for more information. Lovely Lucy is a real sweetie but would best be suited to a home without small kids around but with a large backyard in which to bound. Contact the Kent Animal Shelter at 631-727-5731 for more information. Super-cute Scarlet was rescued from a life on the street--yet despite that experience, she's incredibly friendly around everyone she meets. A ton of fun, this social lady is so good she may even prove to be a friend to cats--but does need a slow introduction to other dogs. Keep in mind, she's been treated for cancer in the past (which means the disease could potentially return), but she's as worthy of a forever family as it gets. Contact the Town of Hempstead Animal Shelter and Adoption Center at 516-785-5220 or email them at adoption@tohmail.org for more information. Details: Shiba Inu mix; spayed. Originally adopted from another shelter, Caramel was surrendered again because of behavior issues. It seems she was never trained properly and was never shown how to be the social, best-balanced doggie she could be--so a perfect forever home for her would be with a family who doesn't have any other animals and can give her the structure she needs. Contact the Town of Hempstead Animal Shelter and Adoption Center at 516-785-5220 or email them at adoption@tohmail.org for more information. Big ol' King Kong is also a big sweetie. Surrendered after his owner was evicted and unable to care for him, he's ready to get back into a home--and for the record, he's great with young children. Contact the Town of Hempstead Animal Shelter and Adoption Center at 516-785-5220 or email them at adoption@tohmail.org for more information. Handsome Leonidas arrived at the shelter last December after being abandoned by his owner. He does dig other dogs, but due to guarding issues he's best-suited to being the only pooch in the house--but as for people, he loves making new human friends. Contact the Town of Hempstead Animal Shelter and Adoption Center at 516-785-5220 or email them at adoption@tohmail.org for more information. Poor Sookie first arrived at the shelter as a stray and was quickly adopted--but was recently returned due to a lifestyle change for her owner. Well-trained, playful, loving and active, she loves to be around people and people love to be around her. Her best situation would be a home where she'd be the only dog and with a family who would relish this peaceful yet attentive pooch for life. Contact the Town of Hempstead Animal Shelter and Adoption Center at 516-785-5220 or email them at adoption@tohmail.org for more information. Details: Pit Bull Terrier mix; neutered. Benny is a smart pup who's eager to learn new commands. A big fan of being brushed, he's playful and loves to walk--and yet he's somewhat hand-shy. A perfect home for this guy would be with a patient owner who will help him strength his trust in people. Contact the Islip Animal Shelter at 631-224-5660 or visit isliptown-ny.gov for more information. Mister Milo is a handsome fellow looking for a peaceful home, as he's being treated for heartworm and needs to be kept calm. He hasn't demonstrated any aggression toward food, treats or toys, and does like other canines but is not really a fan of cats. If you're looking for a bright-eyed silly dog that will make you laugh, this funny fellow is waiting to meet you. Contact the Islip Animal Shelter at 631-224-5660 or visit isliptown-ny.gov for more information. Sweet, playful Layla is all about fun, but is also well-versed in basic commands and takes treats smoothly. She digs other dogs but her fondness for cats remains undetermined--and due to her energetic nature she's best suited to a home with older children. Contact the Islip Animal Shelter at 631-224-5660 or visit isliptown-ny.gov for more information. With his signature underbite, Forest has a face that stands out in a crowd--as does his friendly personality and fondness for other canines. Cats do make him a little nervous at first, but he gets used to them in time. Visit Posh Pets Rescue online at poshpetsrescue.org for more information. Gentle Winston is a love who relishes affection and playtime with other doggies. A big fan of children too, he does need some practice on not wanting to eat people food, but needs no practice in wanting walks and loving people. Visit Posh Pets Rescue online at poshpetsrescue.org for more information. Six-pound Ginny is skinny and small but a ball of energy--which makes sense, as she's still very much a puppy. So young in fact she needs another dog in her life for playtime, although she likes cats and children too--and yet with so much vigor she still just loves a good snuggle. Visit Posh Pets Rescue online at poshpetsrescue.org for more information. Such a cutie, Daisy is a small pup who Is a little on the shy side at first--but once she gets to know you, she's good with everybody, including children and other dogs. Visit Posh Pets Rescue online at poshpetsrescue.org for more information. Adorable Carmel lost her original home when her owner fell on hard times and couldn't care for her anymore--but this cutie still has lots of pep in her step and would love to find a home she'll call hers for good. Contact the Kent Animal Shelter at 631-727-5731 for more information. Poor Fiona's got a sad back story; her owners moved and left this beautiful lady behind. Incredibly sweet and loving, shes also got energy to spare and is ready to be the amazing canine companion in a wonderful forever family. Contact the Kent Animal Shelter at 631-727-5731 for more information. Just a pup, young Kevin is a floppy-eared friendly fellow rescued from a high-kill shelter in Texas. He arrived on LI with his awesome personality and is more than ready for his forever home. Contact the Kent Animal Shelter at 631-727-5731 for more information. Young Kali arrived recently from a high-kill shelter in Texas. She's new to the area and kind of shy at first, but with a loving family she's a sure bet to break out of her shell and become an amazing part of a forever family. Contact the Kent Animal Shelter at 631-727-5731 for more information. Super-sweet Kiki is a baby beagle recently rescued from a South Carolina high-kill shelter. She may be a touch shy at first, but show her some love and shell show you plenty in return. Contact the Kent Animal Shelter at 631-727-5731 for more information. Puppy Pablo was delivered to the shelter by the police as a stray--but he's a lovebird, not a jailbird! Sweet as the day is long, he loves new people and wants to be everyone's buddy. He's probably OK with other doggies; he'll just need a slow introduction. Contact the Town of Hempstead Animal Shelter and Adoption Center at 516-785-5220 or email them at adoption@tohmail.org for more information. A pup who grew up with other dogs and around small children, Bentley has had homes before but is now waiting for a permanent residence. A cute and friendly guy, he's well-trained and ready for a forever family. Contact the Town of Hempstead Animal Shelter and Adoption Center at 516-785-5220 or email them at adoption@tohmail.org for more information. Sweetheart Miley lived her life in a home with another dog but was surrendered at age seven. It's hard for an animal that knows life outside a shelter to suddenly be in one, so if you're looking for a playful, active, affectionate buddy, meet this girl who's a true companion. Contact the Town of Hempstead Animal Shelter and Adoption Center at 516-785-5220 or email them at adoption@tohmail.org for more information. Tiny Ed only weighs a mere ten pounds, making him a pretty easy pup to pick up. He's good with older children, great with cats and dogs, but is a little on the shy side so he'll need a gentle intro upon first meetings. Visit Posh Pets Rescue online at poshpetsrescue.org for more information. Born in California, Jackie came all the way to LI and is ready to have a Long Island home of her own. Gentle and friendly, sweet and easy to be picked up, shes a fan of kids, cats and other canines. Visit Posh Pets Rescue online at poshpetsrescue.org for more information. Sweet Mooney is a "Morkie" with an adorable mug and a sweet outlook on life. Good with other dogs and cats, he's also a fan of children and a perfect candidate for a forever home. Visit Posh Pets Rescue online at poshpetsrescue.org for more information. Still a puppy and only eight pounds in total, Neela is an easy grab--literally! Just pick her up--and she'll be glad you did as she's sweet, gentle and a real pal. Visit Posh Pets Rescue online at poshpetsrescue.org for more information. Oso has a sweet disposition and cute mug to match. He digs kids, cats and other doggies, making him a match for just about any family. Visit Posh Pets Rescue online at poshpetsrescue.org for more information. Young Roxie is a loving lady who will likely jump on you to show it. She knows some commands and is definitely down for kiss and ball play time--she's just still got a lot of puppy in her, so no small children for this lady until she gets a bit more training. Contact the Islip Animal Shelter at 631-224-5660 or visit isliptown-ny.gov for more information. Great Gretel is a sweetie who also loves to explore and play. Already good with some commands, a treat here and there would probably help her learn even more--but she doesn't need any inspiration for walks and playtime--she's always ready to do those things. Contact the Islip Animal Shelter at 631-224-5660 or visit isliptown-ny.gov for more information. Talk about a perfect pal-- Benny likes just about everyone he meets. He does need a little leash training, but is otherwise more than ready to find a forever home. Contact the Islip Animal Shelter at 631-224-5660 or visit isliptown-ny.gov for more information. Outgoing King is well-named as he likes attention from everyone around--but is an outgoing and sweet dude all around. A fan of toys and children too, he's best-suited to be the only dog in his forever home. Contact the Islip Animal Shelter at 631-224-5660 or visit isliptown-ny.gov for more information. Handsome Max is a young fellow who loves taking long walks, but is best-suited to a home where he'd be the only pet in the place. Contact the Kent Animal Shelter at 631-727-5731 for more information. Holly arrived from a high kill shelter in South Carolina with a litter of puppies. The pups have all since been adopted, and now it's her turn for a home of her own. Contact the Kent Animal Shelter at 631-727-5731 for more information. Just like her name implies, Cookie is a real sweetie--but while she loves human companionship, she's best-suited to a home where she'd be the only animal of any sort. Cookie is a sweet 2 year old Hound mix. She's a doll, however she does not want to share her home with cats or other small animals. Contact the Kent Animal Shelter at 631-727-5731 for more information. Bobby is a rescue from a high kill shelter in South Carolina. Playful as can be, he's a lot of fun and would be a perfect fit for almost any family looking for a fun four-legged friend. Contact the Kent Animal Shelter at 631-727-5731 for more information. Mr. Nate was once a stray found staying in a park, but now he lives to lay in people's laps. Playful and clearly a cutie, he's curious about other dogs but could use some socialization training--but overall is extremely ready to have a home of his own. Contact the Town of Hempstead Animal Shelter and Adoption Center at 516-785-5220 or email them at adoption@tohmail.org for more information. Arriving as a frightened stray, Piper needs a few moments to warm up to new people--but once she knows you she's just a perfect pup. Quite playful but not very aggressive, she's an energetic dog (and a really high jumper!) best suited to an active family with older children. Contact the Islip Animal Shelter at 631-224-5660 or visit isliptown-ny.gov for more information. A former stray, Dorito is good with other dogs but as he's a bit too pushy with his fellow canines, a home where he's the only pooch is probably for the best. Goofy, friendly and playful, this attention-seeking guy is more than ready for a forever home with a loving family. Contact the Islip Animal Shelter at 631-224-5660 or visit isliptown-ny.gov for more information. She's active, she's friendly, she's Olivia! A little pushy with other pups, she's best-suited to a family without other dogs, or at least one that can provide some training--but otherwise this big mush just needs a lap to sit in and a backyard for bounding. Contact the Islip Animal Shelter at 631-224-5660 or visit isliptown-ny.gov for more information. Energetic Nellie is a playful lady who loves a good walk, a game of ball and trips to the park. More trusting of women than men, she'll ready for a forever home but likely will need some time to adjust. Contact the Islip Animal Shelter at 631-224-5660 or visit isliptown-ny.gov for more information. Sturdy Gary is a strong but obedient dog who likes other canines but is no fan of cats. A sweet playful guy, he's more than ready for a forever home. Contact the Islip Animal Shelter at 631-224-5660 or visit isliptown-ny.gov for more information. A big fan of belly rubs, Ziggy is fun-loving but takes his fetch very seriously. He'll walk by your side and is always tuned in your words. Calm and respectful, he's playful with his toys but never destructive. Visit Posh Pets Rescue online at poshpetsrescue.org for more information. Baby Abby is new on Long Island, as she was recently saved from a high-kill shelter in Texas. Contact the Kent Animal Shelter at 631-727-5731 for more information. Young Arlo is just a pupp, new to Kent after being rescued from a Texas high-kill shelter in Texas. Kent Animal Shelter at 631-727-5731 for more information. Shy Stormy starts off nervous, but once he warms up he likes to snuggle in laps or hang by your side. Give him a chance; he's got lots of love to give. Contact the Islip Animal Shelter at 631-224-5660 or visit isliptown-ny.gov for more information. Shy Sporty Kiera loves to run, climb and jump. Sweet and a real kiss-giver, this loving lady will sit in your lap in a heartbeat. For more information, contact the Islip Animal Shelter at 631-224-5660 or visit isliptown-ny.gov. Details: Pit Bull mix; spayed. Mia is a friendly lady who knows here commands and really likes people. She's good with being handled and doesn't show aggression but does need some leash training. If you'd like to help this loveable lady with her learning, contact the Islip Animal Shelter at 631-224-5660 or visit isliptown-ny.gov for more information. Details: Pit Bull mix; neutered. Sweet and fun-loving Gambit is super-friendly and has a ton of energy. He's good with people and most dogs, but does have some guarding issues. Small dogs and cats aren't suitable for him, and due to his moxie he's really best-suited to older children only. Contact the Islip Animal Shelter at 631-224-5660 or visit isliptown-ny.gov for more information. Friendly Penne likes everybody, period. A bit shy at first, she warms up fast and shows her sweetness. Energetic and playful, she likes other dogs but she's not a fan of cats. Contact the Islip Animal Shelter at 631-224-5660 or visit isliptown-ny.gov for more information. Details: Siberian husky / German shepherd dog mix; spayed. Sapphiro is a fluffy fellow loaded with love. Best-suited to a home with children over age five, he's affectionate and energetic--if you can handle that, bring this guy home pronto. Contact the Southampton Animal Shelter Foundation at 631-728-7387 or southamptonanimalshelter.com for more information. Details: pit bull terrier mix; spayed. Rescued from the destruction following Hurricane Florence, Clarabelle was found chained to a tree by her neck, the collar embedded into her skin. She was then placed in an overcrowded shelter--before being brought to Southampton that is. She's now the dog she was meant to be--friendly, loving yet strong--she loves people, loves children, other dogs--you can't go wrong with a lady like this. Contact the Southampton Animal Shelter Foundation at 631-728-7387 or southamptonanimalshelter.com for more information. A recent arrival from a municipal shelter, Grumpy is a smart and good-looking fellow who is also a serious cuddle-bug. He's spent enough time on the move--he's ready for a forever family, so if you're on the prowl for a poochy pal, drop by and meet this guy. Contact the Southampton Animal Shelter Foundation at 631-728-7387 or southamptonanimalshelter.com for more information. Older Layla is a calm, relaxed lady who sadly lost her home when her original owner was evicted. She likes long walks and loves to cuddle--but she would need to be the only pet in the home. Fine with kids older than 12, anyone adopting her will have access to free training consultations to help get her acclimated. Call 516-883-7575 or visit animalleague.org for more information. Currently a resident of the NSALA Westhampton facility, Raven is a sweet girl is really loves her snacks--like, really really--but also loves snuggling and relaxing in the sun. A perfect home for her would be adults-only and where she'd be the only pet. Call 516-883-7575 or visit animalleague.org for more information. Young Ruby, currently staying in the NSALA Westhampton facility, likes to have lots of space in which to play--and do her signature "figure eight" moves--yet despite her energy, she's best-suited to a relaxed adults-only home with experienced grown-ups who know how to handle dogs well. Call 516-883-7575 or visit animalleague.org for more information. Handsome Laio (pronounced "Lay-o") was surrendered to the shelter after her family moved away. Playful but mellow, she's best suited to a home where she'd be the only doggie in the home. Contact the Town of Hempstead Animal Shelter and Adoption Center at 516-785-5220 or email them at adoption@tohmail.org for more information. Fun guy Tillito loves to pal around, as he always has time for good times. He's ready for his forever home, and almost any would do--he just needs a slow introduction to new canine friends. Contact the Town of Hempstead Animal Shelter and Adoption Center at 516-785-5220 or email them at adoption@tohmail.org for more information. Details: Cane Corso mix; neutered. Handsome Thunder was surrendered by his former owner, who left him shy after years of abuse. He remains sweet and playful nonetheless, but is best suited to a home where he'd be the only pooch. Contact the Town of Hempstead Animal Shelter and Adoption Center at 516-785-5220 or email them at adoption@tohmail.org for more information. Found abandoned, tied to a pole with her own leash, Trudy somehow remains a friendly and trusting pup. She does however prefer her muzzle not be touched, and while she likes other dogs a slow introduction to new canine friends is her preferred way. Contact the Town of Hempstead Animal Shelter and Adoption Center at 516-785-5220 or email them at adoption@tohmail.org for more information. Sweet Marley is kind and affectionate, so much so she lights up a room with her lovingness. She's such an angel--a perfect fit for any family. Contact the Town of Hempstead Animal Shelter and Adoption Center at 516-785-5220 or email them at adoption@tohmail.org for more information. At eight years of age, darling Buddy is no baby, but he's a lovely boy nonetheless. Surrendered by his previous owner, he's affectionate, chatty and playful--but is also easily startled. His fearful ways mean his forever family will need to be patient as he adjusts to a new life, and probably should live somewhere he's the only animal, but he'll bring lots of sweetness in return. Contact the Town of Hempstead Animal Shelter and Adoption Center at 516-785-5220 or email them at adoption@tohmail.org for more information. Details: American Pit Bull Terrier mix; neutered. Poor Azul spent all of his six years living solely in a backyard. He has never really been socialized with people, but he totally loves playing with any and all dogs. New people make him nervous, but once he gets to know you he goes into total mush mode--a totally cuddle pup. Laid back and great on his leash, an owner with previous canine experience would be his best fit for a forever friend. Contact the Town of Hempstead Animal Shelter and Adoption Center at 516-785-5220 or email them at adoption@tohmail.org for more information. Details: Golden Retriever/Labrador mix; spayed. Super-cute Sandy is a four-year-old beauty surrendered by her former owner. Purchased as a puppy, she's best-suited for a family who can work with her food-guarding issues. She does dig other dogs, and likes strangers too, so if she sounds like a fit for your home contact the Town of Hempstead Animal Shelter and Adoption Center at 516-785-5220 or email them at adoption@tohmail.org for more information. Money was surrendered by his original owner, then taken back by that owner--yet somehow he returned to the shelter as a stray--and on that second occasion the original owner neglected to come back. It's hard to imagine anybody not wanting this cute fellow with his playful ways and adorable personality--so on that note, anyone seeking a forever friend should consider this heck of a dog. Contact the Town of Hempstead Animal Shelter and Adoption Center at 516-785-5220 or email them at adoption@tohmail.org for more information. Big Ruger is a whopper of a pooch, but a gentle giant to be certain. He gets by without an overwhelming need for attention, but love and affection go a long way. Playing fetch and ball is always good for this guy, and while he's sweet due to his size he's probably a better fit for a family with older kids. But other dogs and adults? He's all in on new friends. Contact the Town of Hempstead Animal Shelter and Adoption Center at 516-785-5220 or email them at adoption@tohmail.org for more information. Details: Jack Russell Terrier; neutered. Best-suited to an adults-only home, Bernie isn't a fan of kids. However, he does like the company of lady dogs and knows his basic commands. He's a handsome-looking guy, and if you're looking for a friend to give lots of attention too, he might be the right dog for you. Contact the Town of Hempstead Animal Shelter and Adoption Center at 516-785-5220 or email them at adoption@tohmail.org for more information. This big fellow is Suzuki--weighing in at around 150 pounds, you'll have lots of dog on your hands should you take him home. Surrendered by an owner who fell ill, he's a good match with adults and kids older than 15. He loves his toys, and digs other dogs, preferably mellow pups much like he is. Contact the Town of Hempstead Animal Shelter and Adoption Center at 516-785-5220 or email them at adoption@tohmail.org for more information. Lilac lost her home when her owner got seriously ill, and she's a little shy with strangers at first, but once you gain her trust it's all good. She's well-mannered, obedient and pleasant; just not a huge fan of cats. Visit Smithtown Animal and Adoption Center online at townofsmithtownanimalshelter.com or call 631-360-7575 for more information. Prince is a loveable guy who's got lots of charm but not lots of luck--he was with one family for most of his life and now he's homeless--but a family that can promise him a stable forever home will be rewarded with a canine friend who will love them to the end. Contact the Town of Hempstead Animal Shelter and Adoption Center at 516-785-5220 or email them at adoption@tohmail.org for more information. Charlotte was purchased as a puppy from a breeder, but due to an eviction got stuck in the shelter. A super cutie who knows her basic commands, she doesn't have a lot of experience with her fellow canines, so a metered introduction would serve her best. Otherwise, she's more than ready to go home with a loving, stable family. Contact the Town of Hempstead Animal Shelter and Adoption Center at 516-785-5220 or email them at adoption@tohmail.org for more information. Found abandoned and living on handouts, Relish is nonetheless all about affection. Keep in mind he's got a heart murmur and worn-down teeth, but his soul's as strong as can be. Visit the Town of Babylon Animal Shelter online at townofbabylon.com or call 631-643-9270 for more information. Kingston was purchased from a breeder, but his owner gave him up as he wasn't great around the kids. He's a well-trained guy, and is said to known commands in both English and German. A best situation for him would be with an experienced and adults-only family. Contact the Town of Hempstead Animal Shelter and Adoption Center at 516-785-5220 or email them at adoption@tohmail.org for more information. Beautiful Bella was sadly neglected by the first family in her life--and yet she's gentle and sweet. If she could stay so warm-hearted despite such cold treatment early in her days, imagine how well a loving family would work for her. Call the Town of Brookhaven Animal Shelter at 631-451-6950 for more information. This sweet lady is Indi--she was a stray saved by a good Samaritan, but while she's off the streets he needs are still not complete. A family to love and a window from which she can watch the world go by, these simple things would be everything to her. Call the Town of Brookhaven Animal Shelter at 631-451-6950 for more information. If you can imagine being surrendered by the only family you've ever known, that's what happened to Mimi, who was given up by her owners and brought to the shelter. However, her spirit is alive and well as she remains a loving, playful and cuddly lady who, once you have her trust, is a total sweetheart. 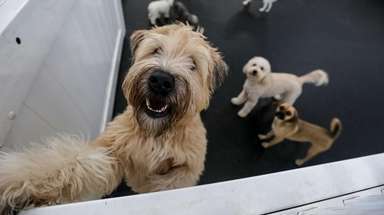 A local owner is preferred, just as part of the trust-building process, and she'll need to meet any dog that might end up a future housemate. Contact the Town of Hempstead Animal Shelter and Adoption Center at 516-785-5220 or email them at adoption@tohmail.org for more information. Caliber is a 5-year-old who likes taking walks and snuggling. If you think Caliber might be right for your family, reach out to Southampton Animal Shelter Foundation at 631-728-7387 or southamptonanimalshelter.com. Here are all of the dog parks on Long IslandFrom amenities to park tips, we've rounded up everything you need to know before you take Fido out for an afternoon of outdoor fun. 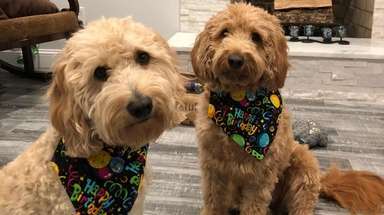 Doggie day care options on LIGone are the days when leaving for work meant having to leave your pup at home for a minimum of eight hours a day. Need a pick-me-up? Check out these pet photosNewsday readers share photos of their insanely cute pets.